Double glazed windows offer a superior barrier to the temperature outside by having the advantage of being made up of two panes of glass which have been separated with either a layer of air or gas. The air or gas acts as a layer of protection that reduces conductivity. It is a form of insulation which is also found on doors as well as windows. The gas used to make these products is argon. This gas works to keep heat from getting out and cold from getting in. 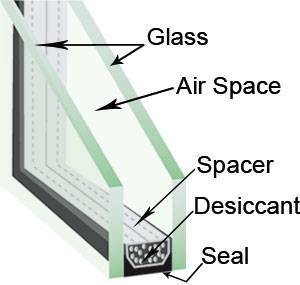 It is a high-density gas which is preferred over air for filling the panes because it is so good at providing insulation. When dealing with old homes they may not have windows which meet the current Australian safety requirements of the glazing code. Double glazing conversions in homes with outdated windows adds the thermal and acoustic advantages they provide and offer more safety. Get more comfort, security, and safety in your home along with the reassurance that the double windows and doors you have are increasing your property’s value. To find out more about IGU/Double glazing glass please dont hesitate to contact us.